The 21km-long Puthukkudiyiruppu-Oddusuddan road progressing through the hinterland of North-Eastern Mullaitivu District, links Puthukkudiyiruppu on the A-35 Paranthan-Mullaitivu highway and Oddusuddan on the A-34 Mankulam-Mullaitivu highway. It was along this road that a trusted deputy of the Liberation Tigers of Tamil Eelam (LTTE)supremo Velupillai Prabhakaran was killed by the deep penetration squad of the Sri Lankan armed forces on September 26, 2001. Vaithilingam Sornalingam alias “Col” Shankar, the founder-chief of the tiger air wing was killed by a claymore mine hung on a tree as he was driving his two-seater four-wheeler pick-up vehicle alone. The killing transmitted shockwaves amongst LTTE circles as it demonstrated the fact that the armed forces were capable of infiltrating the heartland of tiger-controlled territory and inflicting lethal damage. The time was around 4.45 a.m. on June 22, 2018 when a trishaw proceeded along Puthukkudiyiruppu-Oddusuddan road to Oddusuddan. It was signalled to stop at the Paeraaru junction by four policemen attached to the Oddusuddan police station. It was simply a random check to ascertain whether the driver had proper identification and authorisation documents. Initially, the vehicle drove up speedily as if he intended defying the police signal. However, it suddenly screeched to a stop. When two policemen approached the trishaw, one of the passengers who appeared to have lost part of his arm from the elbow downwards jumped out of the vehicle and ran off in one direction. The second passenger got off from the other side and ran off in a different direction. Two cops then gave chase to the second man and managed to apprehend him while a third constable ran after the other man who evaded arrest. The fourth policeman prevented the trishaw from evasion though the driver did not display any signs of attempting to do so. A quick search of the vehicle showed that two bags and two parcels were being transported. 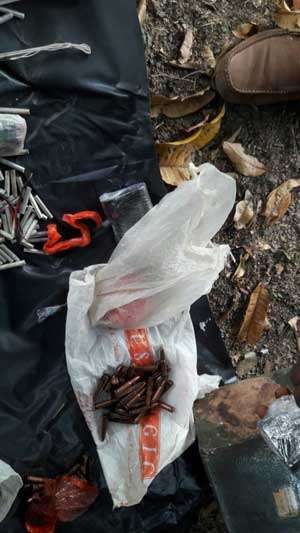 The cops were shocked when the cursory inspection of the contents revealed explosives, arms and ammunition in addition to material connected to the Liberation Tigers of Tamil Eelam (LTTE). The two arrested men along with the vehicle and baggage were taken to the Oddusuddan police station. A thorough search resulted in the discovery of one claymore mine, two pressure mines, two hand grenades, 98 rounds of T-56 ammunition, four remote control devices, six electronic detonators, two LTTE military fatigues, three t-shirts embossed with the tiger logo, two red and yellow LTTE flags and two large rolls of wire. The revelations shocked the Oddusuddan Police who immediately alerted the Terrorism Investigation Division (TID) of the police stationed at the Mullaitivu town. TID officers from Mullaitivu arrived at Oddusuddan and took away the two arrested individuals, trishaw and items seized to Mullaitivu. The TID hierarchy immediately dispatched two special teams from Colombo and Vavuniya to Mullaitivu. 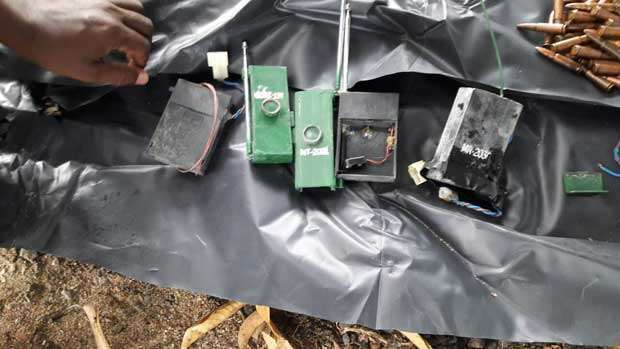 A perusal of the claymore mine revealed that it was an LTTE-manufactured explosive named “Bhavaan.” The claymore weighing 15 kilos had been named after an LTTE cadre “Capt” Bhavaan also known as “Aiyaah” who was killed in combat in 2005. A swift search was conducted in the semi-jungle areas surrounding the Paeraaru junction for the man with an impaired limb who had escaped. He was known as “Aehaambaram.” The other arrested person was called “Dinesh.” It is not clear at this juncture whether Aehaambaram and Dinesh are their real names or convenient nom de plumes. Under interrogation, the trishaw driver said he had nothing to do with the arsenal and other LTTE material in the trishaw and that they were being transported by Dinesh and Aehaambaram. The vehicle was reportedly proceeding towards a house frequented by Dinesh in the outskirts of Oddusuddan. The TID conducted a search on the residence and arrested the occupant of that house too. An intensive search was conducted in Oddusuddan. Several people were taken in for questioning and released. The three arrested persons and LTTE materials seized along with the trishaw were taken to the TID Northern Headquarters in Vavuniya for further interrogation and closer scrutiny. It was disclosed that escapee Aehaambaram as well as the arrested Dinesh were former members of the LTTE. Both had been detained after the LTTE was militarily defeated in May 2009 and were subsequently released after rehabilitation. The man known as Aehaambaram was a resident of Saanthapuram in Kilinochchi. The trishaw driver was from Thiruvaiyaru in Kilinochchi and was apparently hired by Aehaambaram on a long-term basis. It was also discovered that the driver had at one time been arrested on suspicion of transporting smuggled Kerala Ganja. A special TID-led police squad was sent to Kilinochchi for further investigations. An intensive cordon and search operation were undertaken in Saanthapuram and Thiruvaiyaru by the TID with the aid of the Kilinochchi Police. Many were questioned. Among them was the elder sister of the hand-impaired man, Aehaambaram. The sister told the police that her brother had gone “missing” in January 2016 and that she had not sighted him since then. She said she lodged a complaint with the police over her brother’s alleged disappearance in 2016. She also said her brother had close contacts with military intelligence personnel in the North. Aehaambaram’s elder sister also said her brother had lost a hand while making an improvised explosive device for the LTTE. She said two of her brothers and a sister were also LTTE members and had been killed in war with the armed forces. The search in Thiruvaiyaru-Kilinochchi in the vicinity of the trishaw driver’s residence resulted in the discovery of four motorcycles hidden in a house. Its occupants said the vehicles belonged to 24-year-old Ketheeswaran, also known as ‘Kethees,’ who was currently warded at the Kilinochchi Hospital due to a stomach ailment. Kethees, a child soldier of the LTTE, had been released after rehabilitation. However, he had been re-arrested two years ago on suspicion of being involved in an attempt to revive the LTTE in the North. He had been released after a period of detention and interrogation. As news of the detection of the LTTE arsenal and tiger-related material and consequent arrests began spreading in the northern mainland known as the Wanni, many ordinary, peace-loving residents got perturbed. They had suffered much during the war and wanted no return to LTTE violence in any form. The police found themselves receiving much information from Tamil civilians. Many of the tips were useless and turned out to be false alarms. However, one constructive tip-off received by the Mankulam Police resulted in the elusive Aehaambaram being taken into custody while travelling along the Mallavi-Mankulam road at Vannivilaankulam on June 23. This was followed by the arrest of Kethees on June 24. TID officials arrested him no sooner he was discharged from the Kilinochchi Hospital. All five key suspects comprising the man known as Aehaambaram, the trishaw driver, his neighbour Kethees, the other vehicle passenger Dinesh and the Oddusuddan house occupant are now being detained at Vavuniya and interrogated by the TID. Police sleuths are tracing the telephone numbers recorded on the mobile phones recovered from the arrested persons. Many have been questioned and statements recorded. Some whose statements did not seem satisfactory were taken to their respective area police stations and intensively interrogated. They were released after their statements were recorded in full. It is learnt that about 15 to 20 persons have had their statements recorded in this manner. They have been told to make themselves available to the police for further investigations whenever necessary. The TID probe is still in a preliminary stage and a composite picture of the situation is yet to materialise. However, initial investigations have raised the spectre of an attempt to foment violence in the North in the name of the LTTE again. It is premature to say whether the LTTE is being revived or the tigers are regrouping, but it certainly appears that a fresh attempt is underway to foment violence in the name of the tigers to create a demonstration effect that the LTTE is capable of raising its head again and inflict deadly damage. It is well-known and widely-accepted that the day of the LTTE as a conventional militia occupying territory is over. It also cannot be a powerful guerilla force capable of confronting the armed forces directly now. What LTTE or pro-LTTE elements can hope for is an isolated attack of the hit-and-run variety. It is possible to plan an assassination or set off an explosive attack in the present politico-military environment prevalent in the North. Against this backdrop, it is suspected that the claymore and pressure mines could have been used to trigger a landmine explosion targeting an important politician or key administrative or defence services official. The LTTE flags and fatigues could have stamped the exercise with the distinctive mark of the tiger. It is strongly suspected that the attempt to foment violence in the name of the LTTE is being backed financially by tiger-ish elements in the global Tamil diaspora. Preliminary investigations have revealed that the chief suspect known for the present as Aehaambaram has a number of identity cards under false names. He also has several bank accounts under different names where sums of money amounting to 30,000 and 40,000 rupees per instalment have been deposited regularly. It has also been found that the man travelled to Jaffna recently for an extended stay in the peninsula during which he reportedly interacted closely with a prominent LTTE diaspora activist vacationing in the North. It is indeed a sad fact of life that the “freedom from fear” ushered in by the Sirisena-Wickremesinghe Government is being exploited by known diaspora tiger operatives to travel to Sri Lanka freely and possibly encourage the return of political violence. However, a troubling factor in this state of affairs is the alleged links of the man known as Aehaambaram to the military intelligence division of the army. It is an “open secret” that the “intelligence” agencies are keeping hundreds of ex-tigers on their payroll as informants. They are paid a monthly stipend and provided immunity from arrest. There is always the possibility of these ex-tiger informants being utilised by intelligence agencies for covert operations. It is also likely that some ex-tigers may turn “rogue” and work according to a diaspora tiger agenda while retaining links with the military for their own protection. If proven concretely that the key suspect operating under the name Aehaambaram is indeed a double agent serving both the State and the LTTE it could drastically alter the course of investigations pursued by police sleuths so far. It is very likely that more details would emerge when three of the key suspects are taken to Colombo by the TID. 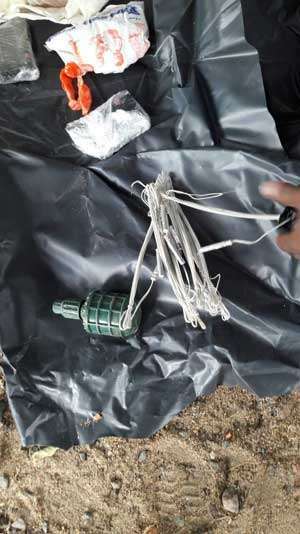 Meanwhile, the detection of LTTE material, explosives, arms and ammunition at Oddusuddan was officially acknowledged by Law and Order Deputy Minister Nalin Bandara who, according to a news report in Daily Mirror, said the government would not allow terrorism to raise its head again. Addressing a news briefing, Nalin Bandara said TID officers were conducting a special investigation into the incident. “Investigations are underway to find out whether there is secret movement or organization that assists the scattered LTTEers to reorganize again,” the minister said. Sri Lanka raised many eyebrows. The government of Mahinda Rajapaksa had in March 2014 proscribed by gazette 16 diaspora organizations and 424 individuals under the United Nations Act No. 45 of 1968. However, after the regime change in January 2015, the new government reversed this designation drastically in November 2015. The present government de-listed 8 organizations and 269 individuals from the previous list. This resulted in only 8 organizations and 155 individuals remaining on the proscribed list. Although this de-listing was severely criticised from a national security perspective, the then Foreign Affairs Minister Mangala Samaraweera justified it on the basis that it was necessary “at that juncture to help expedite the reconciliation process.” Incidentally, the de-listing was done on the eve of a visit to Sri Lanka by then US envoy to the UN in New York, Samantha Power. Now, the same Sirisena-Wickremesinghe Government seems to have had second thoughts on the listing issue. The reasons which led the government into designating 14 LTTE linked individuals remains so far in the realm of the unknown and will very likely become the focus of a forthcoming article in these columns. However, there are a few puzzling points deserving mention at this point of time. 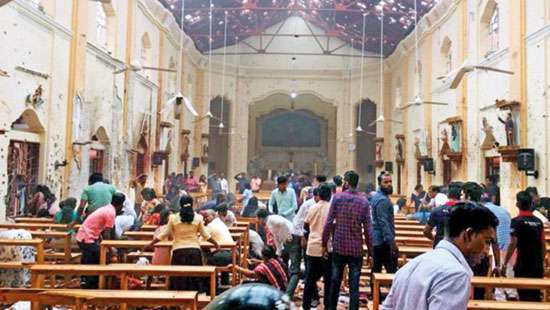 At least two of the designated individuals Kamalasingham Arunakulasingham alias Kamal and Jeevarathnam Jeevakumar alias Siranjeevi Master have for long been suspected of maintaining links to Sri Lankan intelligence agencies. The Sri Lankan intelligence network succeeded in infiltrating many LTTE diaspora organizations in the aftermath of the war against the LTTE and Kamal and Siranjeevi Master were allegedly key instruments in this exercise. In fact, a few Sri Lankan journalists were even politely requested not to write about these two by informed sources. While Kamal based in Norway operates mainly in Europe, Siranjeevi Master handled Asia shuttling among Malaysia, Thailand and Indonesia. However, Siranjeevi has reportedly shifted to Japan recently. Another person of interest in this list is Sivasubramaniyam Jeyaganesh alias Ganesh. Jeyaganesh based in France is widely-known among Tamil diaspora circles as Samraj. Heis currently in charge of overseas LTTE finances in Europe. He is said to be running a number of commercial establishments in different parts of Europe registered in the names of trusted confidantes. Jeyaganesh alias Samraj hit the headlines when his 41-year-old wife Paheerathy Murugesu and 8-year-old daughter Pahalavi Jeyaganesh were stopped by TID officials at the Bandaranaike International Airport in March 2015. They had arrived in Sri Lanka in February 2015 and were to board a flight back to Franceafter a month-long vacation. The TID let the daughter, a French citizen, go but continued to detain the mother, a permanent resident of France, saying she had been a former member of the LTTE sea tigers. It later transpired that the ulterior objective behind the detention was to pressure her husband Jeyaganesh to come to Sri Lanka and then detain him. The plan did not work as Jeyaganesh and Paheerathy, who married in 2005, had formally divorced in 2012. After much legal wrangling, Paheerathy was released. She returned to France while Jeyaganesh in his Samraj avatar continued to oversee LTTE finances in Europe. 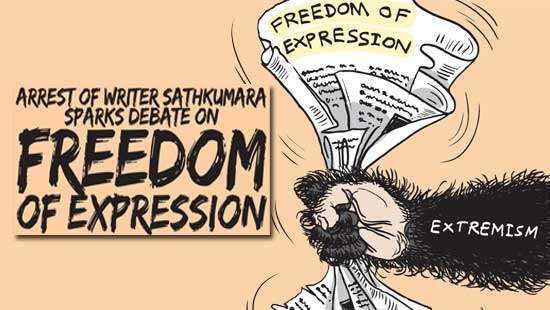 The gazetting of 14 LTTE members including Samraj, Siranjeevi Master and Kamal evoked a derisive reaction from former President Mahinda Rajapaksa. According to a news report in “Ceylon Today,” Mahinda Rajapaksa commenting on the gazette notification banning 14 persons had said the move came in the wake of the 14 arriving in the island, travelling to Kilinochchi, getting what they wanted done and leaving with money. The former President noted that in the light of this, the issuing of the gazette was laughable as it was akin to closing the stable door after the horse had bolted. “At a time when a majority of the countries in the world are acting against terrorism, why is Sri Lanka following a lax policy and according to whose agenda?,” he queried. The former President’s statement about shutting the stable door after the horse had bolted provides much food for thought. Does Mahinda Rajapaksa have reliable information that the 14 persons had travelled to Kilinochchi, accomplished what they wanted to do, got what they wanted and returned safely to their countries? 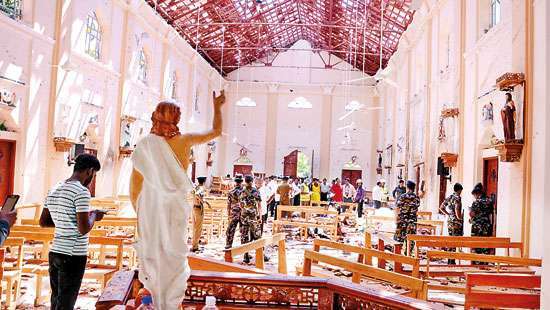 If so, have the Sri Lankan authorities been caught unawares and are reacting only after the damage was done? Worse still have the overseas tigers with links to Sri Lankan intelligence taken their handlers for a ride? Or is the Medamulana Machiavelli simply trying to score debating points against his political rivals? One is unable to furnish definite answers at this point of time but the existing reality in the North tallies with the essence of what Mahinda has been saying. Ever since the Sirisena-Wickremesinghe Government came to power and removed the fear element prevalent under the Rajapaksa regime and ushered in “Freedom from fear,” there has been an influx of overseas Tamils into Sri Lanka. Many Tamils who feared arrest in Sri Lankafor having attended an LTTE event abroad now felt secure in travelling to Lanka. Unfortunately, this freedom has been exploited by LTTE and pro-LTTE elements who too have been sojourning in Sri Lanka without fear. The tiger-ish elements have been promoting an extremist agenda in Lanka in the recent past. It is felt that a lot of tiger money is being pumped into Lanka to foment violence. What the tigers need at this point of time is not sustainable violence with a long term perspective but an immediate exhibition of violence for short-term demonstration effect. In that context, it must also be noted that attempts by diaspora tigers to foment violence in Sri Lanka did not commence after the present coalition government came into power only. Although Mahinda Rajapaksa is trying to project an impression that tiger activity did not exist under his rule from 2010 to 2015, the reality is different. There have been many attempts by the diaspora Tigers to foment violence in Sri Lanka after the war ended in May 2009. Mercifully, none of them was successful. A brief re-run of post-war history shows there have been several such attempts in the years after 2009. Some of these happened during the time Mahinda Rajapaksa was President and his sibling Gotabaya, the all powerful Defence Secretary. Some have occurred after the current government came to power. Most of the diaspora LTTE-backed abortive attempts to cause violence have been written about in detail in these columns in the past. One does not know how the investigations into the Oddusuddan detection would proceed or whether details of a diaspora LTTE backed plot to foment “tiger violence” would be uncovered, but there are two salient points that need to be emphasised here. The first is that the LTTE has indeed been militarily wiped out in Sri Lanka, but the fact remains that the overseas tiger branches described wrongly as the “rump” are not destroyed yet. Secondly, the overseas Tigers are capable of fomenting violence in a bid to revive the LTTE in Sri Lanka or project an impression that it is being done so. It is important to distinguish clearly between a real revival, genuine revival attempt and an exercise aimed at creating an impression that the LTTE is being revived. A full-scale revival of the LTTE and a return to the past where the Tigers were a formidable force is virtually impossible in the present situation. There could however be no guarantee that attempts would not be made to revive the LTTE despite those efforts proving unsuccessful. Since Tiger elements in the diaspora would continually finance such attempts the dangers exist. There is a need therefore for constant vigilance as there is little room for complacency in matters like these. At the same time, it must be realised that the Tamil people who have suffered much during the war are in no mood for a return to LTTE-sponsored conflict again. Whatever the attempts by Tiger-ish elements in the diaspora to promote violence in Sri Lanka, it is doomed to fail in the final analysis because the Tamil people themselves are unwilling to extend support.